This week I’ve been amazed by the variety of wildlife – notably the terrestrial invertebrates. As this year has progressed, I have found that I am getting really intrigued by inverts, especially insects! The range of shapes, sizes, colours and so on – and even just in one group (such as my favourite group, the moths!). Below are some of the moths I’ve caught this weekend, whilst not showing the extremes in the range of shapes and so on, they are all lovely moths I think – I can’t decide which one I like the most! Naturally all of the species has been noted down and will be sent to the county recorders. A highlight of the week was discovering a new and slightly weird fly. 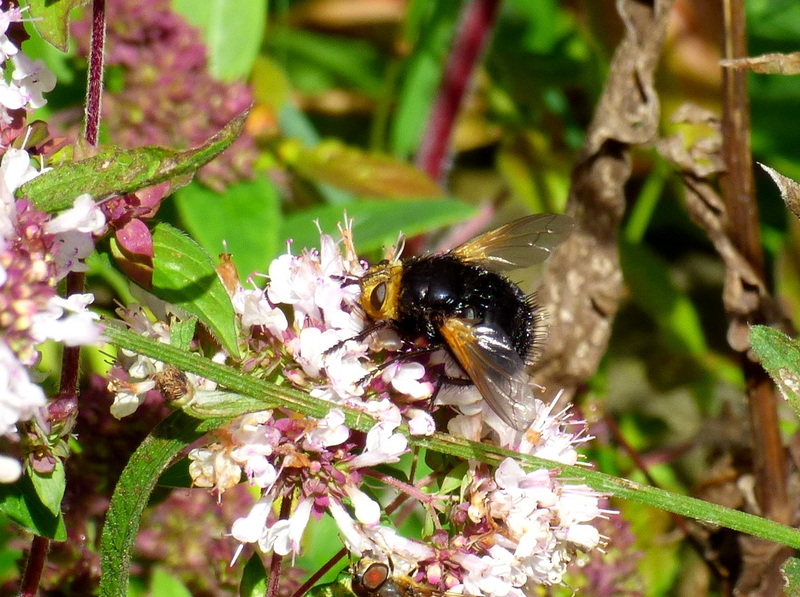 It’s called a Giant Tachinid Fly (Tachina grossa), which lays its eggs in the caterpillars of moths (usually big hairy caterpillars such as the Oak Eggar Moth Caterpillar). When the young hatch, they then eat the caterpillar! Gross but fascinating! The fly itself also looks pretty odd, I don’t know if the photo below shows just how big it is. It was the size of a stereotypical bumblebee, absolutely huge and really loud when buzzing about! What else has happened this week? I went off to a Field Studies Council – Preston Montford in Shropshire, to learn about spiders and harvestmen. It was a great day, though I’m a little overwhelmed at the identification of them! I did get a free spi-pot where you’re able to immobilise the spider / harvestmen without harming them, so it’s possible to get a really good look at them and their anatomy. As mentioned before, I went looking for butterflies on the reserve and saw Small Tortoiseshell, Peacock and Small Copper. I also took some photos of wildflowers to practice my wildflower ID. Whilst out, I also saw a number of cool fungi, but I don’t know fungus identification at all I’m afraid. And then, saving one of the best parts of the week until last, whilst I was out on this reserve adventure, I saw a woodpecker! 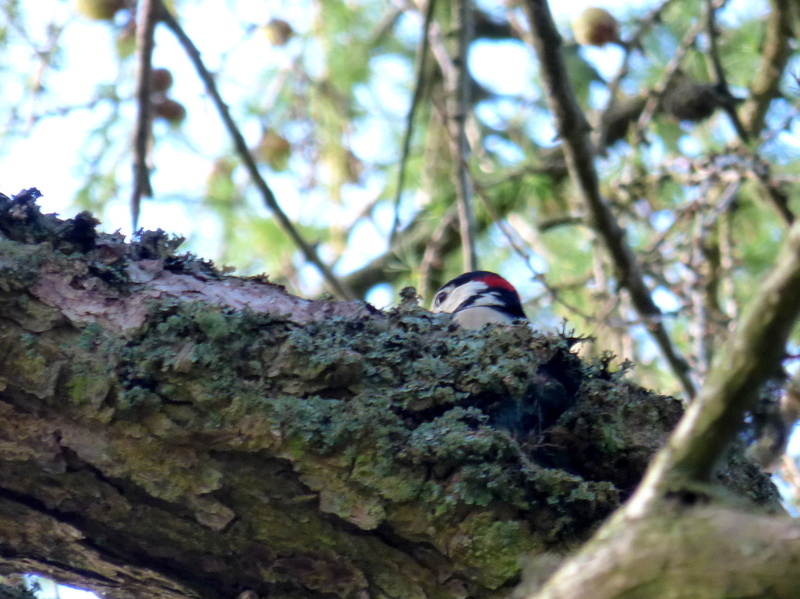 Unfortunately it wasn’t being very obliging for taking photographs, but I don’t mind too much, I saw a woodpecker! Lovely sightings and photos as always Megan. You should be proud of the great work you are doing! Thanks Ryan! It’s so exciting to keep finding new wildlife! And I’m looking forward to writing next week’s post after the AFON conference!